Windows 7 includes Windows Internet Explorer 8 (IE8), which enables you to browse Web pages anywhere on the Internet. Windows 7 makes it a snap to launch Internet Explorer 8. However, when you launch Internet Explorer 8 the first time, you need to go through a setup. The following steps allow you to choose certain options. The choses made below are merely suggestions; you can, of course, customize IE8 to work the way you want it. These are simply some of the most common setups. Click the Internet Explorer icon on the taskbar or choose Start→All Programs→Internet Explorer to launch IE8. A setup screen welcomes you to Internet Explorer 8. The first question asks whether it’s okay for Microsoft to keep records of your Web browsing, all the time. Select No, Don’t Turn On button to protect your privacy. Click Next. The setup program asks whether you want to set up using the default settings. Choose Custom Settings. Click Next. Setup asks whether you want to keep Live Search as your default search engine. Select Show Me a Webpage after Setup to Choose More Search Providers and click Next. Setup then asks whether it can download updates for your search provider. Yes is usually best here, particularly if you go with a stable search provider like Google. Click Next. 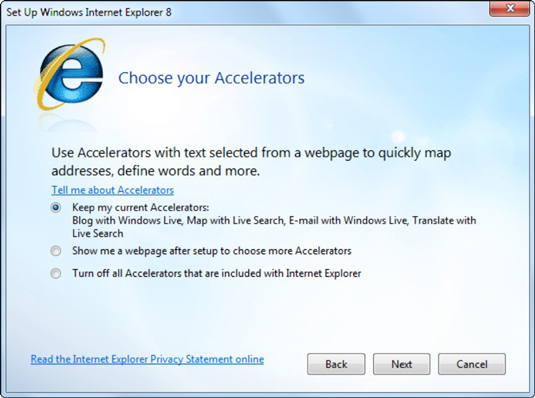 Setup asks whether you want to choose more Accelerators. For now, choose the default Accelerators. Click Next. You can always add more Accelerators by clicking Page→All Accelerators→Manage Accelerators. 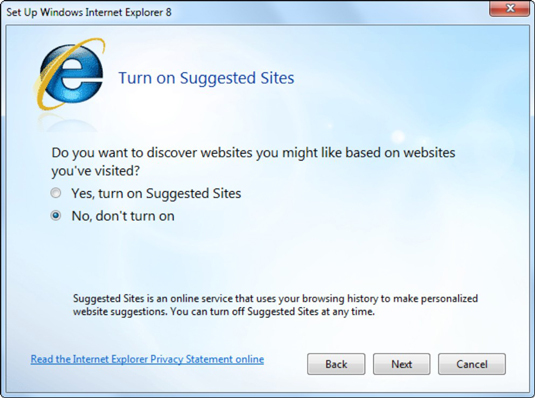 Internet Explorer wants to know whether it can become your default Web browser. If you want IE8 to be your default, select Yes. Deselect the check box that says Import Settings from My Other Browsers (unless you have settings out there from other non-IE browsers that you want to transfer), and then click Next. The setup routine wants to know whether you want to use Compatibility View updates, which enable older Web sites to work by making IE8 look like IE6 for those sites. Choose Yes, I Want to Use Updates. Click Finish. 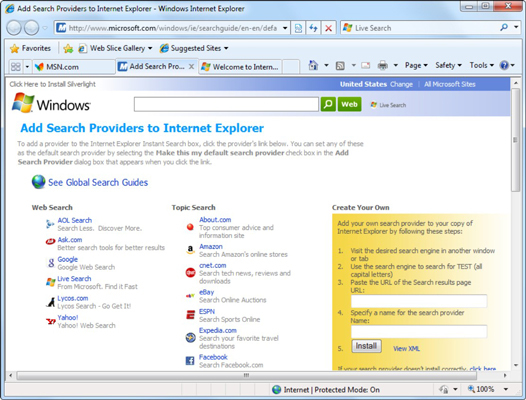 Internet Explorer comes up for air with three tabs: MSN (unless the company that sold you the computer took over that screen), the Add Search Providers list, and a Welcome to Internet Explorer 8 screen. 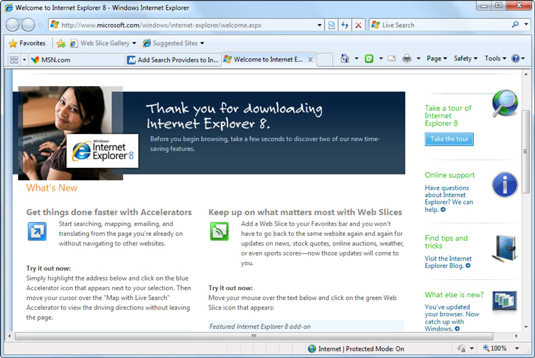 Click the Welcome to Internet Explorer 8 screen and look at the introductions to Accelerators and Web Slices. Take a few moments to follow the directions to see how these features work. Click the Add Search Providers tab. You see the old Add Search Providers to Internet Explorer page. On the left side of the page, click your favorite search provider’s link. Select the check box marked Make This My Default Search Provider, and click Add. Congratulations! IE8 is ready to roll.